The official online travel resource for visitors to Greater Phoenix has been retooled to better meet the needs of its primary users: women and people on the move. Prospective travelers who log on to visitphoenix.com from their home computers and laptops will now see an online interface that’s cleaner, softer and warmer than its predecessor. And travelers who access the website from their smart phones or tablet devices will be able to get hotel, dining and entertainment suggestions based on their whereabouts, thanks to the integration of location-based technology. These changes to visitphoenix.com are the direct result of analytical research by the Greater Phoenix Convention & Visitors Bureau and BarkleyREI, the interactive marketing agency that executed a complete redesign of the website in November 2009. “We also created a new navigation category for ‘Special Offers’ so it’s easier for value-minded visitors to locate discounts and package deals provided by our member businesses,” Gogel said. The Greater Phoenix CVB’s member businesses include resorts and hotels, golf courses, museums, water parks and adventure outfitters—almost all of whom offer special discounts during the summer. 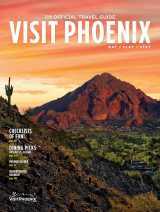 Data gathered by the Greater Phoenix CVB also showed a 422 percent boom (2010 vs. 2011) in the number of users who access visitphoenix.com from mobile devices. When users of smart phones and tablets such as the iPad point their browsers to visitphoenix.com, they are automatically routed to a mobile website with an interface tailored to those devices. That interface is now cleaner and more linear, and its menus—such as “Things to Do,” “Where to Stay,” and “Where to Eat”—incorporate location-based technology to provide suggestions to mobile users based on their location in the city.